I haven't tried out many Nail Vinyls before so when Nail Polish Canada reached out to me and asked if I would like to try a set, plus have 10 free sets for you to try, I jumped at the chance! Nail Polish Canada has asked a bunch of Canadian bloggers to create and share about these Nail Vinyls from Whats Up Nails and are offering a code for each to give away 10 sets of Nail Vinyls for Canadian readers. If you want to see how I used my set of nail vinyls to come up with some easy Canada Day nail art, keep reading. 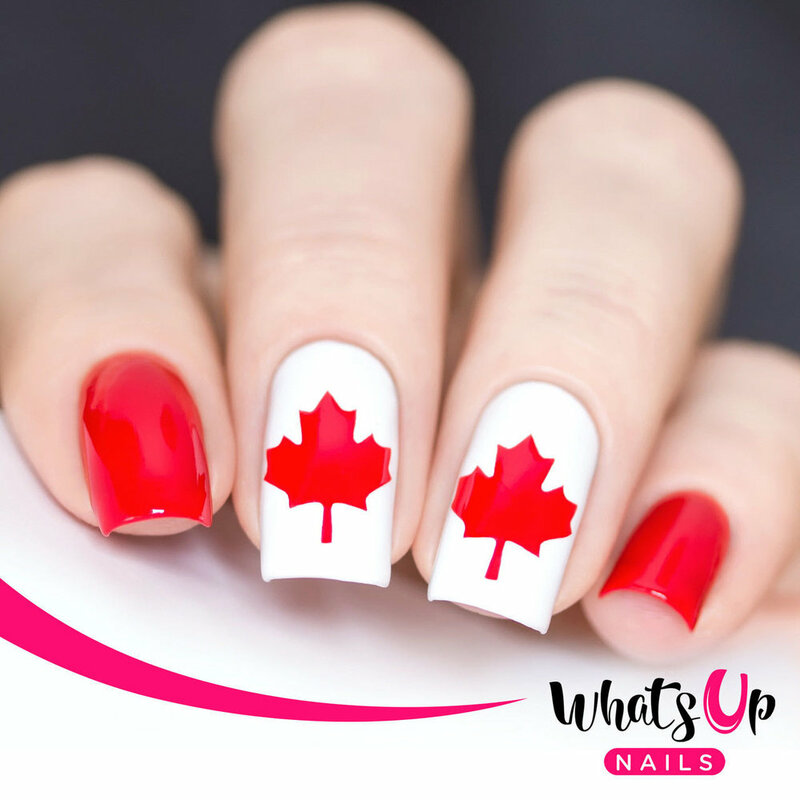 As you can see above is one way you can use the Whats Up Canadian Flag Nail Vinyls to create some great nail art. I started with a Base Coat followed by 2 coats of Morgan Taylor Pretty Woman on my pinky and thumb, and 3 coats of Morgan Taylor All White Now on my 3 middle fingers. Using the stripping tape, or tape, I split my index and fourth fingernail in half and painted half with Morgan Taylor Pretty Woman and quickly taking the tape off as soon as I had finished painting them before the polish dried. I than simply took the centre of the nail vinyl, where the Maple leaf is and stuck it in the centre of my middle finger nail. Top it off with a coat of top coat and Voila! 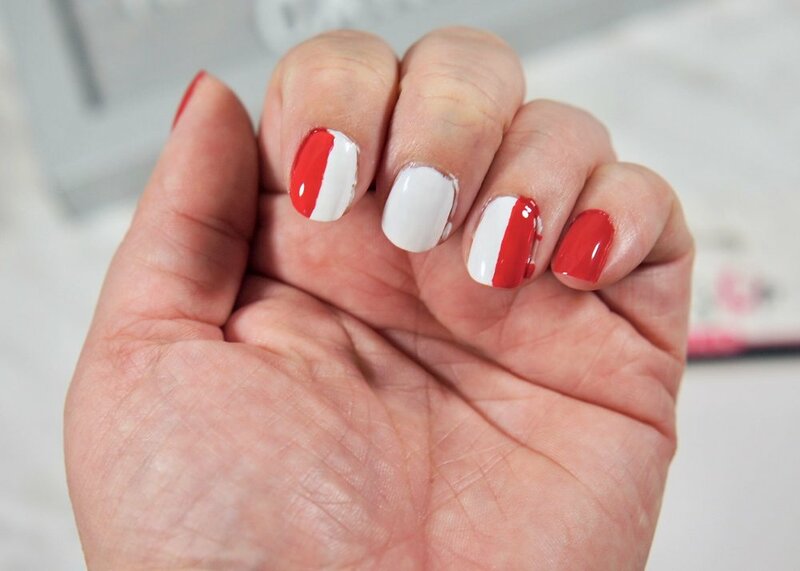 easy Canada Day Nail Art! Clean up the edges as best you can, I am not the greatest at cleaning up my nails afterward, especially since I can't seem to find pointed q-tips anymore! I was quite happy to find out that Nail Polish Canada carries one of my favourite brands of Nail Polish, Morgan Taylor at I think is a reasonable price of $11.95 CAD a bottle, with free Canadian shipping starting at $19.00. Now for the fun part for you! If you would like to be rocking some Canada Day Nails come July 1st, you can head over to Nail Polish Canada and use my code, FC170E691 , to get your own completely free set of Whats Up Canadian Flag Nail Vinyls! My code will work for the first 10 people who use it. If you enter my code and its not working, that means 10 people have already claimed my code, but Nail Polish Canada will have links to the other Canadian Bloggers who have also teamed up with them so there will be some more codes for you to try. It will also be a good place to get some other ideas on ways to use the free Nail Vinyls.